The summer may have not long begun but the sporting events have already been making headlines across the world. One of the biggest sporting events in this year’s calendar is the World Cup, which is taking place right now in Russia. This year’s event kicked off on the 14th of June and the final will be played on the 15th of July. The World Cup is the most watched sporting event in the world. The first ever World Cup was played back in the summer of 1930 in Montevideo, Uruguay, with Mexico versus France and USA versus Belgium being the first games played – both at the same time. This year, 32 countries made the cut to qualify for the World Cup and now just four teams remain for this week’s semi finals to see who will make it through the final on Sunday 15th June. France, Belgium, England and Croatia have all made it through to the semi finals. Whether you’re heading to Russia to watch the games or watching it in your local bar or even at home, you can soak up the party atmosphere in style. Having the right outfit can help you celebrate, no matter what team you’re supporting. The new collection of Summer 2018 elevator shoes from GuidoMaggi includes a model dedicated to the World Cup. The Mundial is the perfect shoe for getting in the World Cup spirit. 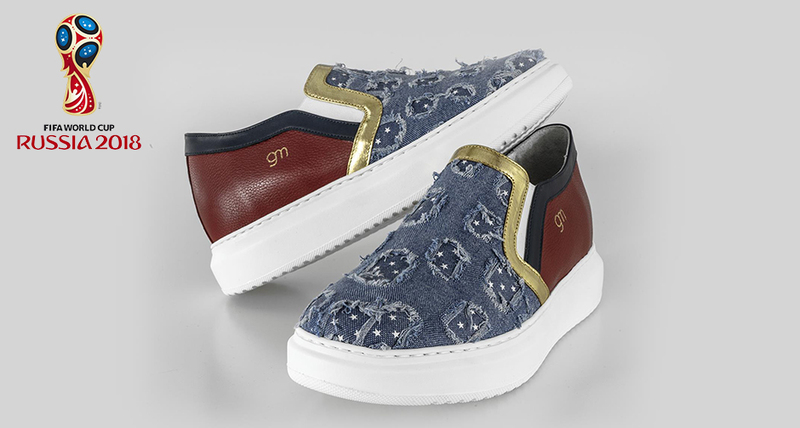 Designed with inspiration from the World Cup logo for Russia 2018, these luxury elevator shoes feature the red, white and blue from Russia’s national flag and the gold from the World Cup. The result is a stylish slip-on that can increase your height by 2.6 inches, giving you the confidence to party on into the night and support your team to the end. One of the great things about these elevator shoes is that they are comfortable. They are handcrafted in Italy using the finest leathers and denim fabric. They can also add a chic touch to your casual outfit, whether you choose shorts or pants, t-shirt or collared shirt. The Mundial is a versatile shoe that should be a must-have for this summer’s sporting events and you can make sure you keep the World Cup fever going long after it’s over.